Cornbread & Turkey Layered Salad Recipe - loaded with cornbread, turkey, cheese, vegetables and bacon! It is a whole meal in one big bowl! Make ahead of time and refrigerate before serving. Can be made 24 hours in advance. Perfect for brunch/lunch. Need an idea for Mother's Day brunch/lunch? 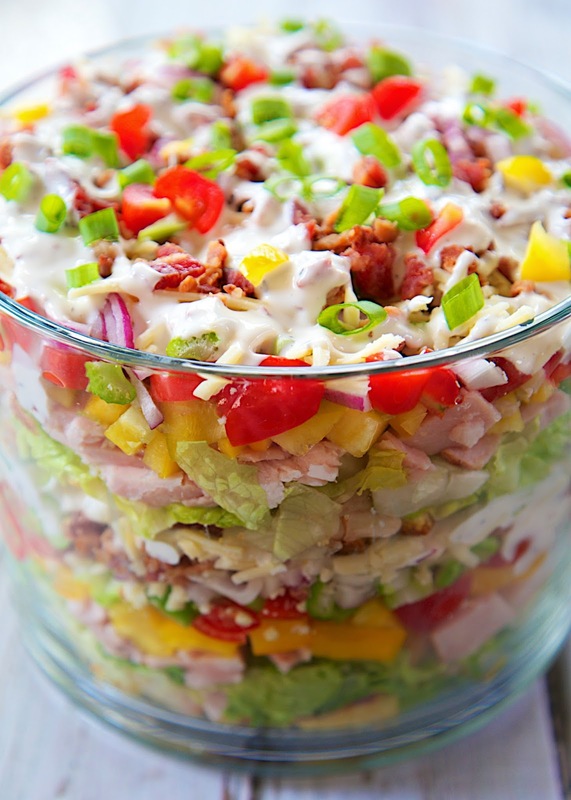 This Cornbread and Turkey Layered Salad would be perfect. It is loaded with cornbread, turkey, cheese, vegetables and bacon! It is a whole meal in one big bowl! You really can't go wrong with this. Not only is this Cornbread and Turkey Layered Salad incredibly delicious, it is also very, very pretty. Look at all those amazing colors. The salad can be made the night before serving. It needs to chill at least 8 hours. We ate this for lunch a couple of days in a row and it tasted great every time. I used a package of cornbread mix, but feel free to use your favorite homemade recipe too. If you don't like any of the vegetables, just swap them out for one of your favorites or double up on one that you do like. Prepare cornbread according to package directions. Cool and chop into small cubes. Set aside. Stir together dressing, mayonnaise and buttermilk. 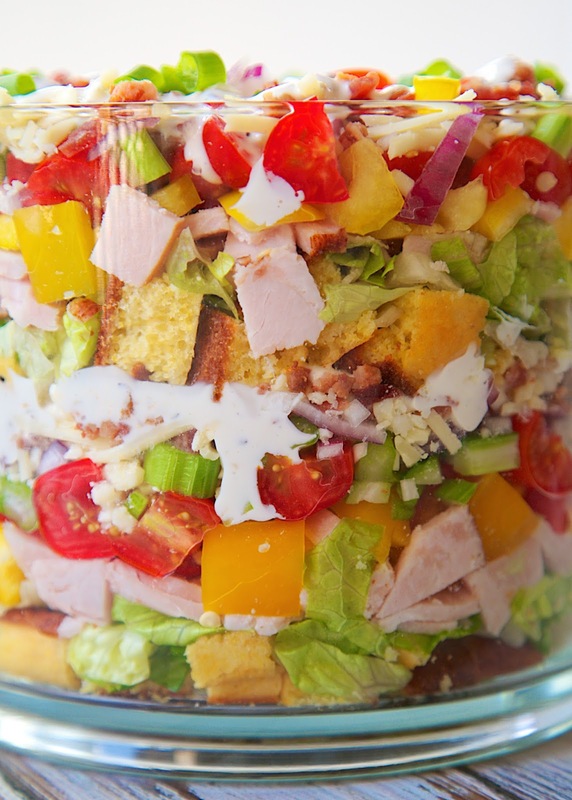 Layer half of each in a large trifle bowl: cornbread cubes, shredded lettuce, turkey, yellow pepper, tomatoes, red onion, celery, cheese, and bacon. Spoon half of the dressing mixture over top. Repeat layers, ending with dressing. Top with chopped green onions. Cover and chill at least 8 hours or up to 24 hours.